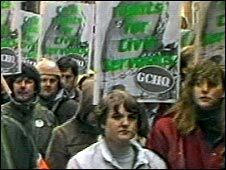 Union supporters are preparing to mark the 25th anniversary of the banning of trade unions at the government's GCHQ intelligence centre in Cheltenham. The ban, on 25 January 1984, was said by the then Conservative Prime Minister, Margaret Thatcher, to be in the interests of national security. It led to a political row and mass protests and 14 workers were sacked for refusing to give up their membership. Unions were restored to GCHQ when Labour returned to power in 1997. Secrecy surrounding the intelligence centre was once so tight, the government did not even acknowledge its existence. But it was thrust into the limelight when Mrs Thatcher outlawed union membership, saying industrial action at the base, particularly during the 1981 civil service pay strike, had undermined the nation's security. Trade unions said the ban was a breach of civil liberties and mass protests followed. Labour put their weight behind the campaign, but it was 13 years before union rights were reinstated at GCHQ with the election of Tony Blair as Prime Minister in 1997. Many of the 14 sacked workers have since retired. Mike Grindley, leader of the union rebels, said: "I'm as enraged now in hindsight, as I was then, the appallingness of it. "It was a vital fight to win and if we'd gone down, particularly in the early days, they'd have followed it up with attacks on other people, fire brigades, home office, foreign office, the more secret areas of private industry. "All would've been attacked on the union side." This weekend, some of the sacked workers will meet with other civil service union supporters to remember their campaign.